While 3D motion capture via iPhone X is coming soon from Unity, software maker Reallusion today offers functionality similar to 3D animation programs. 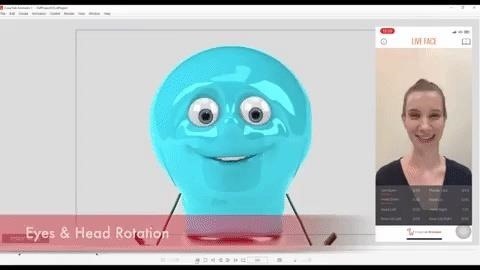 With CrazyTalk Animator 3, users can now add animations to virtually any image and animate them to life with movement effects and templates on a PC or Mac. When connected to an iPhone X, the Live Face app can give these animations their own facial expressions and emotional performances. Image from Reallusion / YouTube  With the TrueDepth camera on the iPhone X, Live Face can track up to 57 facial features and facial expressions such as head angle, eyebrow height and accurately track eyeball position. At the same time, the app can detect mouth movements for live performances or audio lip-synching. The resulting animations can be edited in videos or viewed in live broadcasts via YouTube, Facebook or Twitch. I've seen a lot of experimentation from developers and some consumer-oriented apps have emerged, but between Unity and Reallusion, it looks like the iPhone X is becoming a legitimate device for professional developers.